At Morrow, Lai, & Edwards Pediatric Dentistry, we embrace technology, whether it’s through the innovative treatments we offer, our Facebook fan page, or our new listing on Foursquare. As you can probably tell, we love connecting with our patients online! 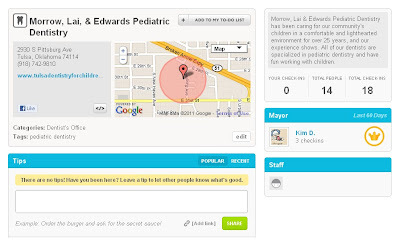 Be sure to check-in at Morrow, Lai, & Edwards Pediatric Dentistry in Tulsa, OK using the Foursquare application on your smartphone for all of the details. You can also share your check-in with friends on Twitter and Facebook. We would also love if you left a “tip” for our office!